Choc compound [sugar, vegetable fat, cocoa powder, emulsifier (322 soy), flavour], condensed milk [milk, sugar], wheat flour, marshmallows (10%) [sugar, glucose syrup (from corn), water, dextrose, gelatine, corn starch, flavour, colour(162)], vegetable oil, sugar, water, red jelly [preservative (223, 202), vegetable gum (401, 410, 415), firming agent (341, 339) , colour (124)], puffed rice (contains barley), tapioca starch [preservative (202)] malt extract (barley), maize starch, (sulphites), butter, cocoa powder, margarine [animal fat, vegetable oil, emulsifier (322 soy), antioxidant (307b soy), colour (160a), raising agent (500, 541), flavour [vanilla flavour, flavour], acid (330), salt. Contains wheat, barley, milk, soya, sulphites. Manufactured in a facility that uses egg, peanuts, tree nuts & sesame seeds. It’s rough and ready, but oh so sweet! 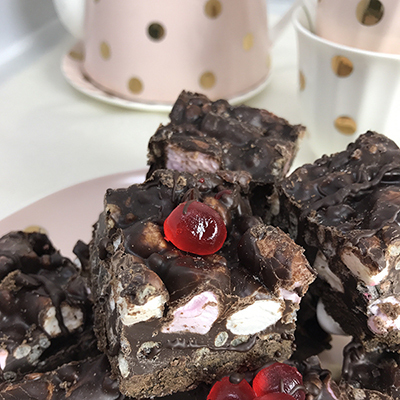 A decadent chocolate slice filled with marshmallows, jellies and crackles. A favourite with everyone.